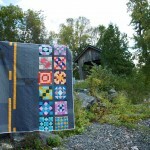 In 2012, I participated in a monthly sampler group at one of the quilt shops in Utica. 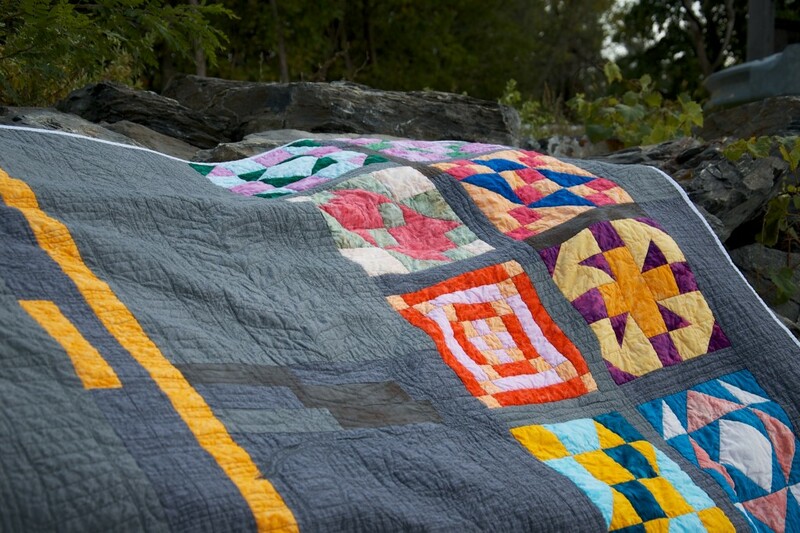 I kept up with the block piecing during the course of the sampler, but they’ve been languishing in a box ever since. I lost track of both the number of times I’ve sketched layouts for the twelve blocks and the layouts I liked, so the blocks sat unset and out of mind. Then, a need to carve out sewing time amidst wedding planning grew, culminating in a strike of inspiration for a simple layout for these blocks. So, out they came! 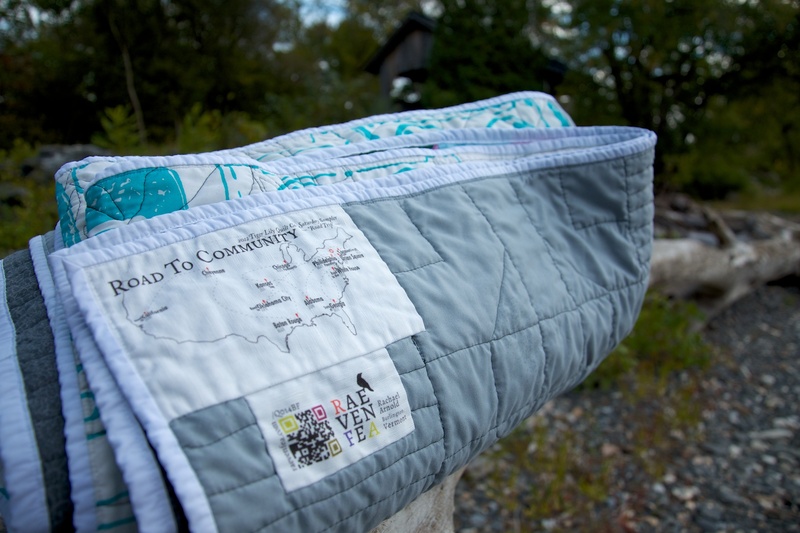 The theme of the sampler was “Road Trip”, with each block name corresponding to a place in the United States. I described each of the blocks in quarterly installments as I was working through them: Road to California, Cheyenne, and Baton Rouge; Road to Oklahoma City, Philadelphia Pavement, and Alabama; Kansas Star, Chicago Pavements, and Union Square; and Connecticut, State of Georgia, and Road to the White House. 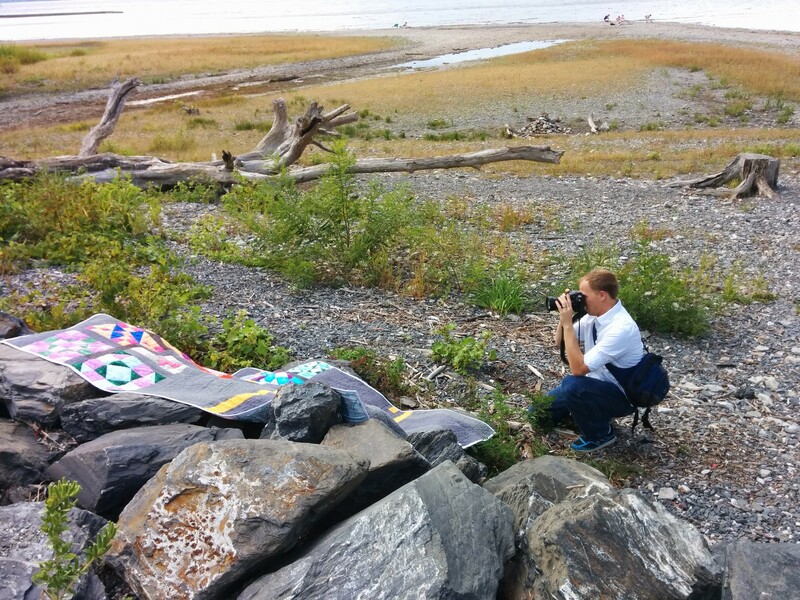 Although the layout eluded me, I knew I wanted to riff off the idea of road trips and asphalt. 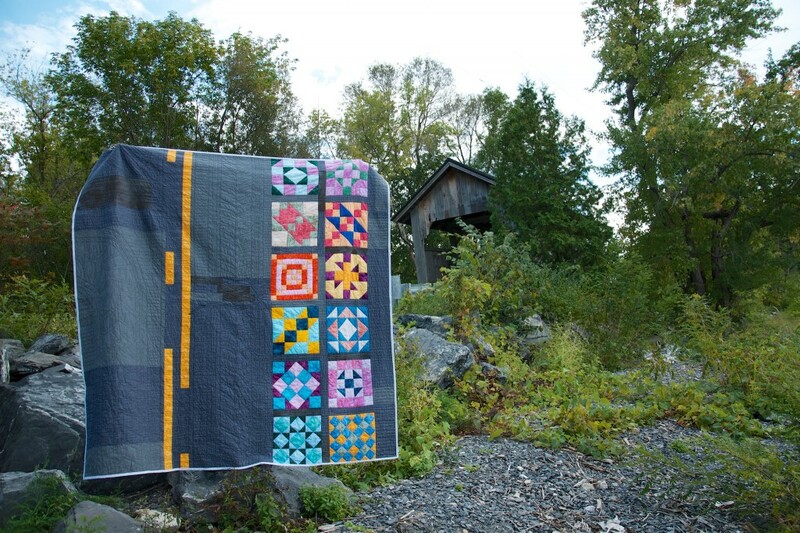 I gathered additional fabric for the quilt as I traveled that year, picking up the grey texture from Downtown (Windham Fabrics) along with white and yellow batiks to fit the road markings and asphalt idea. I realized later that there wasn’t nearly enough of the grey texture, so I purchased a length of Crackle (also Windham Fabrics). The final layout mixes those two grays and a third mottled gray fat quarter from my stash in an arbitrary arrangement pieced to get the lengths needed from the fabric I had on hand. The chunks of different shades remind me of the patched roads in central Missouri that I spent so many hours on during summers of my childhood. While some kids played the “don’t step on the black tiles of checkerboard floors” game, I played the “don’t let my feet touch the floorboard over the clay-red road sections” game to amuse myself when the four of us were packed in the back seat of a Honda Prelude en route from Kansas City to the Lake of the Ozarks. 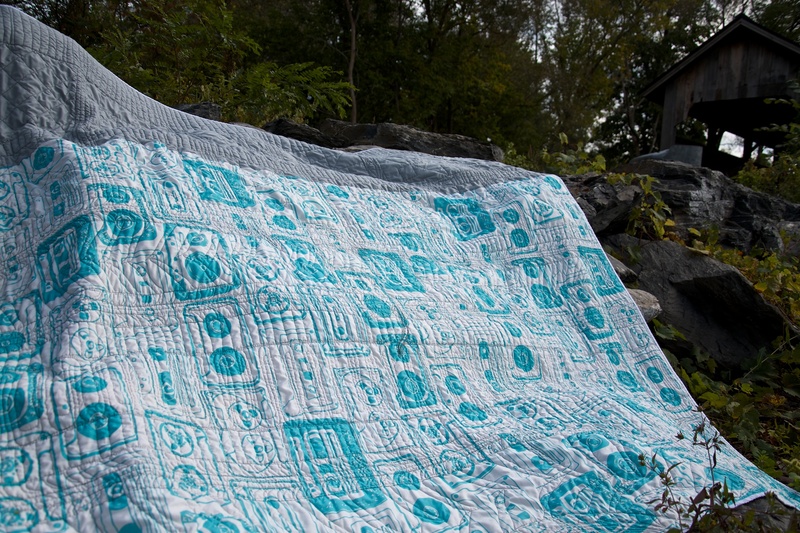 It took another few months before I had a chance to quilt it. 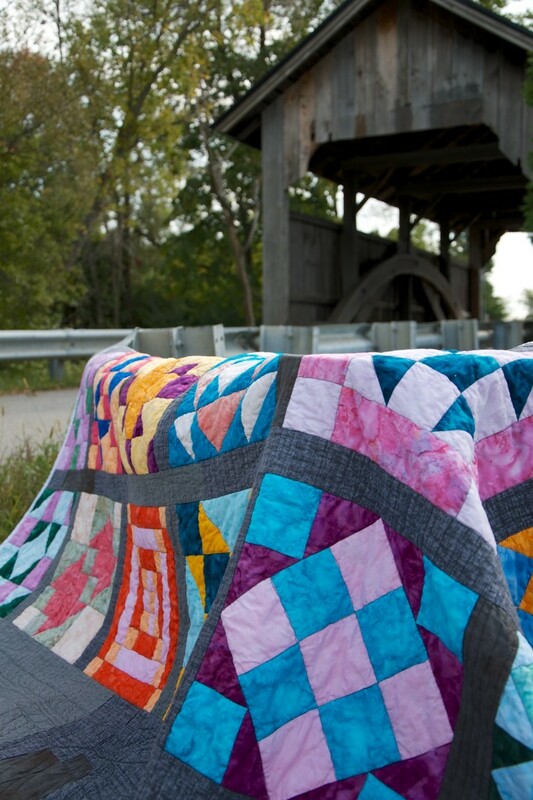 The quilting is a mix of stitch in the ditch and free motion. I took inspiration from rumble strips for the road markings, tire tracks in the open spaces, some filler “cracks”, and free-motioned lines to fill in the rest of the space. The blocks are stitched in the ditch to not obscure the colors with the dark gray quilting thread (don’t look closely at my attempts to free motion stitch in the ditch with contrast thread, please!). Fairfield Quilters 80/20 batting provided a good quilting surface (and was the only thing I had to go out and purchase in 2014 to complete the quilt). The backing started life as an XL twin duvet cover that I bought on clearance at Target a few years ago. I was disappointed when I unpackaged it and found that it had a gray back rather than the print on both sides. Even with the accompanying sham, there wasn’t enough printed fabric to piece the full back, so I left one of the seams in the duvet and called it good enough. Its origin seems quite fitting to the theme considering that I now have to road trip to shop there (oh how I miss thee, my clean, organized, red and white homie). Of course, the print fits too, considering the reliance on cassette tapes if one planned to have any music on those central MO trips. It’s bound in a white batik that I bought intending to use in one of the other possible top layouts. I tried a new method of machine binding (sew to back, flip to front, secure), and am insanely happy with how it turned out. It’s almost perfect. 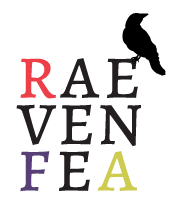 The final piece was a custom label I designed as we worked on the blocks and printed on one of my Spoonflower label orders last year. 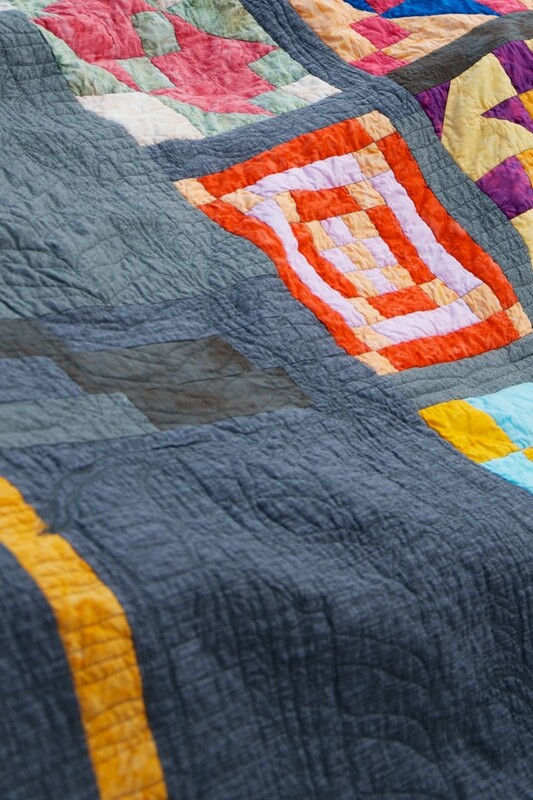 Throughout the course of the sampler, I found the community of quilters in Utica that I was so sad to leave. I hope I can find one here in Burlington soon. Just don’t tell them that the duvet cover backing is polyester (another thing I didn’t realize when I purchased it). That should stay our little secret.